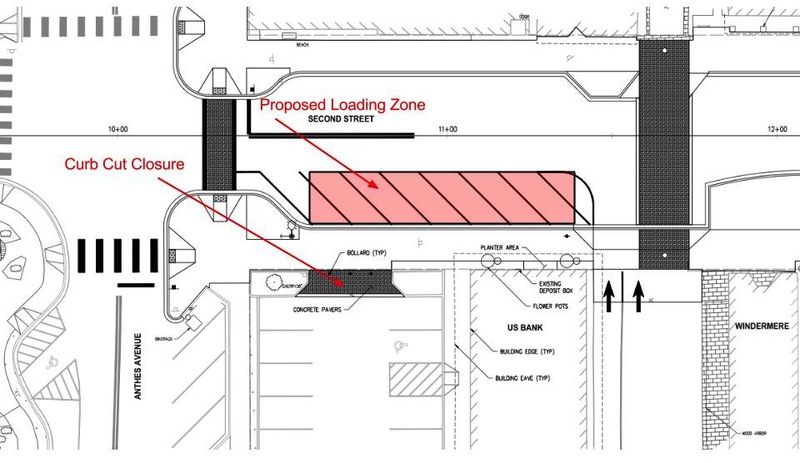 As part of the Second Street Project the city intends to establish one full length truck loading zone in front of the US Bank by closing the curb cut closest to Anthes. This truck loading zone would serve as the only designated truck loading zone on Second Street. This proposal was developed in response to input we received during the public involvement process as well as a technical analysis. Prior to finalizing the decision to establish a single full size truck loading zone the city is interested in hearing any concerns from local businesses. The city is committed to providing safe and convenient truck loading on Second Street to support the local businesses. Please use the form below to submit any comments directly to the Dept. of Community Planning (comments will not be posted on this site). May 31, 2013 in Second Street Project.